by Dave from The Longest Way Home ~ August 1st, 2018. Published in: Travel blog » Nepal. 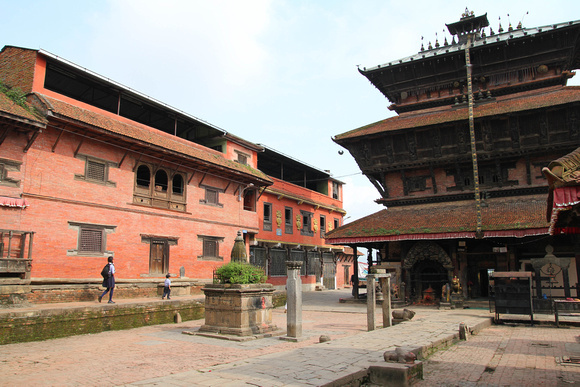 This is the Bagh Bhairab Temple Complex in Kirtipur, Kathmandu which contains many interesting artifacts and a better view of Kathmandu than you’ll find in Swayambu! Have you ever visited a place and had a guidebook say something is there but it’s not. Or maybe say something that’s inconclusive about an object like “nobody knows”. A little bit of research goes a long way. That’s the purpose of a travel guidebook. You are buying research and knowledge to help guide you in travel. I know a lot of people might not have an interest in the nitty gritty of culture or heritage or what mountain is that far distant one. But, I do feel some of the more nonchalant travel writing these days is not particularly helpful. You’ll often see guidebooks make a quip or humorous note about things they don’t know about. To me, it’s just a lazy approach. One such occurrence has bothered me for years. The Dhartimata or mother goddess statue in Kirtipur in Kathmandu. I’ve written about visiting Kirtipur before. 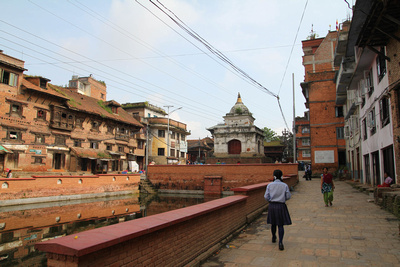 And I’ve an online travel guide about Kirtipur. So I’ll skip the whole “you should visit Kirtipur” bit. Other than to say if you want to get away from the crowds, package tourists and see some virtually untouched Newari culture that’s 20 mins from Kathmandu, go! 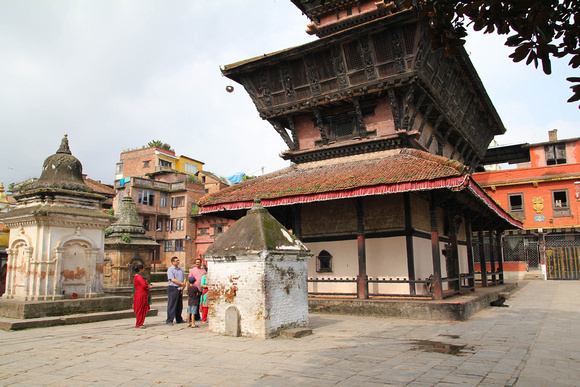 Located around the large Bagh Bhairab Temple complex are many interesting shrines. It also has one of the best look out points across Kathmandu. The temple itself is also fascinating and unique, but we’ll save that for another day. In an alcove in the far south east corner wall is a shrine (statue) to the Hindu mother goddess Dhartimata. This is the alcove where you’ll find the Dhartimata statue – the writing on the wall comes from women who ask to become pregnant or for a safe delivery of their child. First things first. The Dharitimata statue is not the one referred to in one book as the statue located in a white shrine near there. That contains a statue to Ganesh (the elephant headed deity) which looks nothing like Dhartimata who is a woman depicted as being in the middle of giving birth! Dhartimata or Dharti Mata/ Dharti Mai is a Hindu mother goddess who supports the earth. 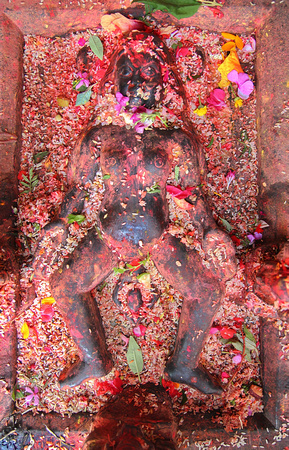 She is often associated as being the consort of Thakur Deo (a god of village land and surroundings). Pregnant women will often pray to her for a safe delivery and for a healthy baby. Many women will even give birth on top of the statue (it’s a flat stone statue – though the one if Kirtipur is up on a wall so it’s not really feasible at this location). Animal sacrifices are also made to Dhartimata. It is here on a Saturday morning you will find a queue of pregnant ladies or indeed ladies who wish to become pregnant queuing up to say a blessing by the statue. If you are here during the rest of the week and come across some tourists, particularly from India, you will often find them going to the wrong shrine – the white one with Ganesh. The shrine is quite dark and difficult to see inside. Many will use a torch, go inside and come out reveling in the fact that it’s Ganesh and not Dhartimata! They’ll then go off and finally find Dhartimatta in the lower corner. Hence one of the importances of using a good guidebook! What is Dhartimata giving birth to? The answer is actually quite reasonable: the Dhartimata statue is shown to be giving birth to a baby with their hands pressed together overhead in the Namaste position. Dhartimata or mother goddess statue depicted as she gives birth to a baby with it’s hands pressed together in a Namaste position. One just has to look at the statue to see this. 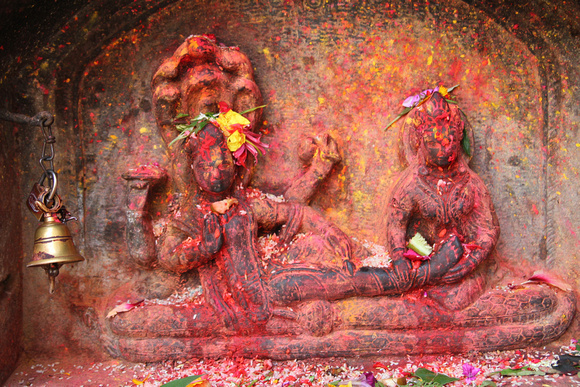 Granted the statue of Dhartimata in Kirtipur is often covered in vermillion and flower petals which are used in blessings. But, one can still make it out. Moreover there’s more than one Dhartimata statue in Nepal where it’s quite clear what she is giving birth to. The other is in the courtyard for the Kankeswari temple in Kathmandu. It’s currently under renovation but you can visit by following the Maru Tole walk in my guidebook to Heritage Walks in the Kathmandu Valley. In Nepal it’s not easy to always get a straight answer. Big commercial guidebooks don’t often have the desire, time nor budget to re-research things or even give the go ahead to a travel writer to find such things out in the first place. Moreover many generic guidebooks have editors and so forth that might want to “lighten” things up a bit with humorous antidotes etc. That’s all well and good, but it’s also possible to do this and have some facts to back things up too. Again, I’m thinking of the Indians being pointed to the wrong location. And, quite frankly the making humor about a deity might be deemed by some as offensive in todays Politically Correct world. I did a lot of research in Kirtipur. The people there are great and take a lot of interest when you ask questions about the place. But many are dedicated to their own religious beliefs. The Newari for example will often have local community or family deities. Those old priests and caretakers have a lot of knowledge and it takes time to understand them. This includes the amazing collection of shrines around the Bagh Bhairab temple and in getting confirmation on the Dhartimata statue. Yes, that’s a self pat on the back. And why not, it took some research to get things correct! Sufficed to say, I’ve included all the correct information about the Dhartimata in my own guidebook to Nepal since day one. Nice insight into the smaller but important treasures that can be found in Nepal. When the large attractions get all the attention and crowds, it’s good to step back and discover the undiscovered! What an interesting and unique find. I’ve always been impressed with the information I find here. Wow such detail in these statues. You are credit to Nepal for taking the time to uncover and investigate such finds. I just feel that things should be documented correctly. So much of Nepali history has large chunks missing. There’s also a clash of cultural history which means what’s known as one thing to some, is not often not recorded by others. I was read there is no entry fee into this temple. How does it stay open without any? And who maintains these statues. I find this aspect of Nepal quite interesting. As of 2018 there is no entrance fee in this area. Will it change? Probably as Nepal currently seems intent in charging tourists for everything. Prior to any charges such buildings would be under the financial and maintenance support of the local community / local municipality and Department of Archeology. Though not always. Think of it this way. Where does a church get money from? It’s very similar. This temple and the grounds are part of religion and culture here. It’s so nice to see statues like this. The fact they are covered in tika and rice is so authentic. Looks like a great place to visit. Again, great work. Especially the second find. It’s a rare statue. Hopefully people will be able to find this correct location due to your great diligence. Yes, there are others like it. Even in better condition. It’s just a shame in some books it’s listed in the wrong place. I’d never have guessed the baby was in a Namaste pose. But since you mentioned this, it’s now obvious! Well done. Yes, it’s not so obvious under all the rice and tikka. There’s another Dhartimata statue which is clearer. The statue looks so old and unprotected. Do you think there is a risk of theft to statues like this in Nepal? I read a NYT article about stolen idols being return to Nepal and was wondering why so many are not in museums there? These statues are part of a living heritage. They are used everyday by people. Putting them in a museum largely takes away the religious aspect of it. in many cases these statues will be used until they are worn away. Then there is an effort by the local community to have a new one created with the aid of a priest etc. Is there a danger of it being stolen? Yes, must assuredly. For hundreds of years local communities have acted as guardians of such statues too. In recent years there’s been a change in culture though and it’s getting more difficult. Many statues are stolen in Nepal. Sadly the big news is focusing on statues from years ago which ended up in museum with by legitimate sale back then or indeed theft and sale. Today, many statues are simply “disappearing” into regional collectors hands. Many are being stolen by locals before moving on outside the country. In some places metal bars protect the statues. It makes everything look ugly. Sadly, this is society today. Is there an answer? Possibly, but it would involve the priests and replicas and perhaps some prayer to link them. Is it ideal, maybe not. It’s living heritage. As such, it’s vulnerable to the current ways of life. It’s always great to hear about the lesser known and not as touristy spots in a country. I always feel like that’s when you experience most of the culture and the place. Thanks for this!